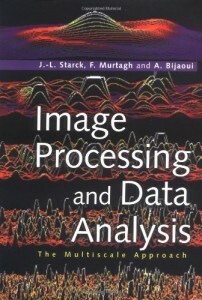 Starck, J.-L., Murtagh, F. and Bijaoui, A., Image Processing and Data Analysis: The Multiscale Approach, Cambridge University Press, 1998. (Hardback and softback, ISBN 0-521-59084-1 and 0-521-59914-8.). PDF file is available here. Description: Powerful techniques have been developed in recent years for the analysis of digital data, especially the manipulation of images. This book provides an in-depth introduction to a range of these innovative, avante-garde data-processing techniques. The unique feature of this book is the complementary blend of theory and practical application - with copious illustrations from astronomy, electrical engineering, remote sensing and medicine. 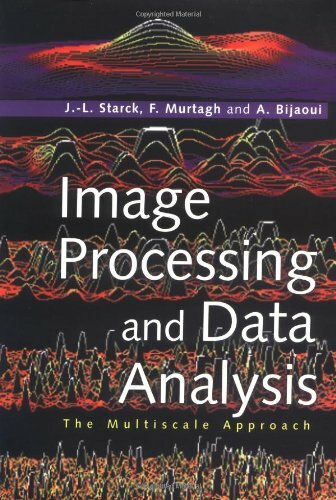 It also shows how traditional methods can be enhanced with the new wavelet and multiscale methods.For graduate students and researchers experienced in image processing and data analysis, this book provides an indispensable guide to a wide range of exciting and original data-analysis techniques.